You, as an owner or tenant in a sectional title scheme, are entitled not to have the use and enjoyment of your unit unreasonably interfered with by other owners and tenants. This means that everyone living in a sectional title scheme should be considerate by keeping their (and their guests) noise levels down when going about their lives at the scheme. However, it doesn’t mean that other owners and tenants are not entitled to make a peep! You also must be reasonable and are expected to handle a reasonable level of noise during ordinary waking hours and on national holidays known for higher noise levels such as new year’s eve. You can try contact your local authority for assistance, but unfortunately it generally has more important problems to deal with than to police residential noise nuisances… For information on interdicts, criminal court orders and other legal options have a look at this article written by Bregmans Attorneys. 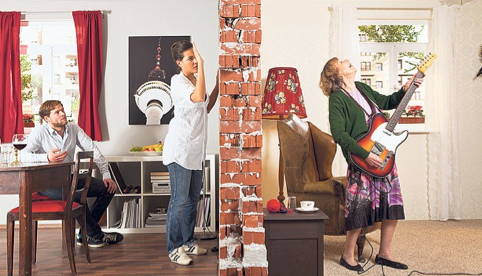 Have you had issues with your noisy neighbour? Do you have tips for other readers to resolve their noise related problems? Please share with us in the comments below. Hi. I live in an apartment and constantly have people walking past my bedroom window talking loudly during the day and at night til early hours of the morning (due to drunkeness). People also shout at each other from their apartments above me to the ground level as well as rolling their trolley bags past my unit (mostly by short term leasing guests). Is there any way that I can get the body corporate to intervene and curb such behaviour? I manage a rental in an apartment block, there is a neighbor who lives directly beneath my tenant, on several occasions she has complained to the body corporate about loud foot steps up a flight of stairs while my tenant is going to their apartment, flushing of toilets, running baths at all hours of the night etc. We have sent out a plumber on several occasions and it has been discovered that the apartment blocks plumbing is very old and nothing has been designed to reduce noise. I find it very difficult to approach this matter with my tenant as i do not believe it is reasonable, i have met with the complainant and she has told me that she wishes she never bought an apartment and we had discussed her complaints as the tenants lease was coming to an end and i wanted to discuss matters before renewing, she had stated that she would like my tenant to stay. These complaints have been going on for over 4 years now. There have been no other complaints from any other owners or tenants in the block, your advise on dealing with this would be appreciated. My neighbour is a young student who lives a very different routine than myself (an 8-5 working guy). He mostly lives during the night and I assume sleeps during the day. More than a year ago when I bought my apartment, I noticed he would often play his music, watch T.V and have skype conversations at the most peculiar hours of the night and morning. Often early hours of a Sunday morning included. My first confrontation with him was at 2am in the morning with him playing his music – to which he responded that he would “turn it down”. However the pattern of behaviour continued for several weeks with him disrupting my sleep and me going over to complain. I contacted my management agent who advised me to contact the security and lay the complaint with them and get a reference number. I did this a few times and it seemed the music and T.V relented somewhat after 11pm (body corporate rules). However I still found his behaviour disruptive as he would mostly arrive home after 11pm and continue to do his dishes and tidy his flat and generally stomp around and slam cupboard doors etc until 3am every night. I contacted the managing agent again and she said there is nothing that can be done to stop him going about his domestic routine. I tried everything from white noise to earlplugs to help me sleep at night, but It still bugged me that I had to go to these extents to live in my own apartment. Sometimes I would even resort to avoiding home and rather sleeping at my girlfriends house to get a decent nights rest. Finally I actually moved out of my apartment and rented it out to recover the expenses I had on the bond. The decision to move out was also financially based, but the noise issue certainly contributed. a year later I moved back in to my apartment and I was relieved to find out that the student next door had moved out. It was a pleasure to enjoy my apartment again. However after three months a new chap moved in and the same pattern started again! Guess what? its the same guy! So now I am resolute not to allow this to get the better of me. My approach has been to be impersonal and simply contact security every time I was disrupted (only between 11pm and 6am). I also contacted my managing agent and notified her of the situation. Now the student has started calling security on me. Last week he called security on me at 10pm when I had guests over for dinner. A second time he left a note on my door at 9pm complaining about the noise from my guests. Now I only have guests over occasionally and they always leave before 1pm latest. So it is clear that his motivation is vindictive. I also notice that he has started banging on the shared wall between our apartments throughout the night while he is studying. I figured it must be his desk or something. So now I have written him a very reasonable, civilized letter and copied in my managing agent. I also supplied him with a set of self adhesive bump-ons to solve the problem of the furniture hitting the wall. I am hoping the new approach works, because if I can get him to stop knocking on my wall that would be a great help. I just hate that it has come to this. I’m not an unreasonable guy I just want to sleep between 11pm and 6am. It seems this neighbour is out to get back at me now. What can I do about it if he does not respond positively? correction: My guest only stay until latest 11pm – not 1pm. As it transpires I was completely wrong about my neighbour. Fortunately my letter was positive and friendly. When I plucked up the courage to follow up my letter with a face to face meeting, I was relieved to discover that he is actually not the same guy I was experiencing problems with before. He responded very positively and seems to be a genuinely reasonable guy. He has only lived next door to me for two months. I assumed it was the same guy who I has having trouble with from before – this clouded my perception and caused me to have a misplaced prejudice against him. A prime example of how past negative experiences can skew our perception of the present and cause misplaced hostility. I think this has been a valuable lesson and it will change the way I approach conflict with neighbours in the future. I have a situation where a bath was run at around 2AM. That was not the complaint from the neighbour below – the complaint is that the water was let out. Can the Body Corporate really penalise for personal hygiene? What happened to distinguishing between deliberate noise and liveable noise? Surely the STA is not that ridiculous! Help! In terms of section 44 (1) (e) of the Sectional titles Act 95 of 1986, “an owner shall (must) not use his section or permit it to be used in a manner or for such purpose as shall cause a nuisance to any occupier of another section”. Should the owner of the unit below be of the opinion that the noise is a nuisance and that it would not be reasonable for him/her to tolerate it, he/she can appoint a plumber (at his/her cost) and arrange with the owner of the unit above that the plumber undertake investigation (at a reasonable and agreed time) in order to determine whether the noise is caused by faulty plumbing that requires repair, in terms of section 44 (1) (c) of the Act. If the plumbing requires repair, it must be determined whether the pipe forms part of the section (the owner’s responsibility) or part of the common property (body corporate responsibility in terms of section 37 (1) (p) of the Act). I recently moved into a complex as a new owner. Two weeks we got home after having supper at a friends place it was just after 10. We were not even inside the house for 15 minutes and was talking about the evening etc. when my neighbor came banging on the door asking us to keep the noise down as he is working the next day which was a sunday. My husband was so irritated about the banging on the door and the mere fact that we just got home with our 3 children. He then told the neighbor where to get off as it was not even 10:30 as yet and we didn’t even make a noise. 8 days later we received a letter indicating that a complaint was laid by the neighbor regarding alleged noise making and supporting his statement that they could hear two people talking loudly that time of the night was the other neighbor next door and the caretaker and her husband who is on the body corporate. Funny enough they all agree it was 11:30 when they heard the noise and that we were playing loud music and had all our doors open. I was standing at the kitchen the time of incident to make bottles for my 10 month old and my husband was in the lounge talking with my niece. Their supporting documents also indicated that the rules was signed of 19 December 1984 and that no noise should be made from 2pm to 4 pm and 10 pm till 7 am the next morning absolute quietness! What I want to know is can rules made 30 years ago still be valid? Especially the afternoon time frame we don’t live in a old age home for crying out loud! Thanks for you information on various topics. It is a great help indeed so see how others handle same situations. As the chairperson I approached a new owner that moved in to ask them to lower their voices as this was disturbing other residents. I was confronted by the visitor to mind my own business and that I was a nosey parker and should mind my own business and leave other people to live their lives as they please. I informed him that I do not need his abuse and that the owner is responsible for his actions. After I explained to the owner what was required they all left. Residents do not realise what their actions are and that they need to respect others for the same reasons they expect respect from their neighbours. There will always be conflict in a sectional title scheme, how this will be handled will depend how the trustees handle the situation. All residents need to be treated equally and fair. Hi Sandy, thanks for the positive feedback. You can browse through the other posts on this blog for more information on sectional title and community scheme living. If there is something specific you are looking for let me know and I’ll see if I can point you in the right direction. I don’t see anything in the Sectional Titles Act that empowers body corporates to issue fines. Does this have to be included in the conduct rules of the complex in order to be valid? Our conduct rules state that the security gate must be kept locked at all times, but certain residents are not complying, so the trustees have issued EVERY owner with a fine because they don’t know who is responsible for leaving the gate open. I object to being fined for something that I know I am not guilty of. Surely the trustees can only issue a fine if they have proof that I have committed the transgression? Hi Linda, it is completely unreasonable for the trustees to fine every owner because they do not know who is leaving the gate open. Fining in sectional title schemes is controversial and will only be enforceable in particular cases if the scheme’s rules provide for it and due process has been followed before the fine is issued. Please read this article I wrote about Fines in Sectional Title for iAfrica: http://business.iafrica.com/property/ideas-and-advice/760196.html for more information. I will make a note to blog about this topic as well as it is an issue that so many owners deal with! Thank you to the Paddock team for the really informative information. this would of course be a big no. We live in units were many races and cultures are living together. We need to understand and try and make it a home for all concerned and not be selfish and in considerate. You’re welcome Renate! So glad you find the blog posts informative 🙂 Your suggestion of having owners make applications to the trustees before hosting noisy events is a good one and could be included in a scheme’s conduct rules. The rule would need to be drafted and passed by special resolution and then filed in the Deeds Registry under cover of Form V before it became enforceable. I had a situation where an arrogant neighbour didn’t care about the noisy parties he would hold during the week until very late and revving motor bikes. I confronted him on numorous occasions and eventually called the police who came out to stop the party, but after the police left he hurled abuse at me and just continued to make more noise until early hours of the morning. I think everyone had enough of him and eventually moved out. Nobody in the complex liked him at all. So maybe if you apply sufficient subtle pressure they will give in, but then some people are just too thick skinned. Hi, I had never lived in a complex before and was appalled when I first moved in to find that I was expected to listen to my neighbours talking, arguing, fighting, etc. every evening and weekends (they have very loud voices and our windows are right by each other). I eventually went over to meet them, with some chocolates. I made light of how much of their private life I now know about and told them I’d be sending them my bill for counselling services if they wanted my opinion on who was right and who was wrong about each argument. At first I think they were a bit shocked that I was being so open, but I eventually got them to laugh about it. We’re now good friends. Occasionally they get carried away, but I’ve noticed they’ve moved their “conversations” away from the room near me so I hardly hear anything any more. It was either handle it like this or go mad from resenting them for the noise. I’m glad I did it this way, although it took a lot of courage. Try it – laughter really is easier and in the long-term, more beneficial, than anger. Wow Suzy! What a great success story and a very perceptive and effective approach. Bravo 🙂 I’m sure many people will benefit from your advice. Thank you! Hi Karen, thank you for your comment. If you are interested in our private consulting services please email: consulting@paddocks.co.za or alternatively visit our website http://www.paddocks.co.za and request a quote under the support services tab. I have a neighbour holding the rules like a shot gun and loves to pull the trigger for every so called violation. She has studied my garden, even looking over walls to see what she can complain about, She will even use rules that do not apply to a situation to find something to complain about. The funny thing is she has not spoke one word to me about what is bothering her about us but runs straight to the board. We get the most insulting and harshes letter I have ever recieved in my life, they never came by either to see us or even find out if these accusations are true. They simply took her word for it about the type of people we are. They even threatened with police intervention. I’ve even been accused of sitting on my lawn revving my bike. I am 45 years old and own a 50cc scooter. (I was on my way to the shop) If only people realise that the rules are not LAW to hold over people, but rather to be seen as the spirit of community. When so fellow arrived on saturday evening, hands on the hips, stamping his foot and arrogantly claiming to be chairman and asking if I have read the rules, I blew my top… now he has requested for my eviction. Geez, did I get an earful from one owner for daring to send this to her NOISY neighbours! Like “what right do you have to send this to my neighbour?” and went on to describe that the neighbour had had an army of visitors the entire weekend with the water running continuously and the noise that would not stop. Hello?? Well done for trying to help! I have three dogs who are approved by the board of trustees which bark from time to time and this started to disturb my neighbours. I have taken their concern to heart and applied variety of correction actions such as bark control devices, treat dispensers, citronella deterrents to keeps the complex cats from entering my yard and stirring the dogs up, full time supervision of the dogs by my spouse, taking the dogs away if they are to be unsupervised for more than an hour. Everything went quiet for about four months and suddenly this week it became and issue. As I was unhappy with the management of the sectional title I lobbied to be elected as a trustee and since I was elected three months ago actively stepped in to the role. I have pushed for common property repairs to take place timeously, improved financial reporting and compliance with rules. While the other trustees remain anonymous and just send letters I have rather spoken to the units as I though this was a productive approach. Since my election I have had units try to report me for illegal alternations which were authorized, others have accused me of having vendettas when I apply the law uni-formally. A unit complained that I left my dustbin in the common property so I reported in to the other trustees and moved the bin. After verbally discussing a unit’s dog that is not registered, often roaming the common property and parking violations with the unit my dogs have not become a problem. The unit’s teenage daughter choose to leave a rude letter on my gate and when I confronted the unit to determine the nature, timing of the barking it turned into a huge conflict. My spouse was retrenched four months ago and has been at home full-time and supervising the dogs. I was very confused when the complaint came because my spouse is of ninety-five percent of the time. This entry was posted on April 22, 2013 by Paddocks in People and tagged Noisy neighbours, sectional title, sectional title property.